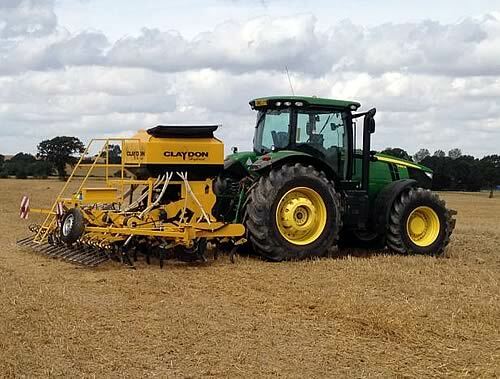 Claydon Drills, which manufactures the patented Claydon Strip Seeding System, will be exhibiting the latest in crop establishment technology at the 2014 Royal Highland Show. The company, which now sells in 24 countries throughout the world, has seen sales of Claydon drills in Scotland increase by 270% during the last 12 months as more and more farmers recognise the benefits of the Claydon System. This enables growers to establish a wide range of crops directly into stubble, min-tilled or fully-cultivated soils up to five times faster and at one-third the cost of a plough-based system. It also provides farmers with up to 10% greater yields, together with environmental benefits. One of the key advantages of the Claydon System in Scotland is the prevention of soil blow, a major issue in regions such as Aberdeenshire where high winds often cause severe erosion if the land is cultivated conventionally. Tested in all soil types and conditions, Claydon’s highly-effective, twin-tine system encourages deep, complex rooting structures to develop quickly, which minimises soil erosion and leads to stronger, healthier crops with improved yield potential. A key reason for the Claydon System’s increasing popularity in Scotland is availability of a new fertiliser placement option, which allows liquid fertiliser to be delivered below the seed, granular fertiliser below the seed or with the seed, or granular fertiliser below the seed and micro-granular fertiliser with the seed. All Claydon fertiliser options are available on new drills, but can be retro-fitted to existing drills. Claydon now offers a full product range of fully-mounted and trailed drills, with fertiliser placement options. The company also manufactures a range of 3m, 7.5m and 15m Straw Harrows along with 6.3m, 8.3m and 12.3m Cambridge Rolls.